Facebook recently confirmed a new feature; a news subscription tool for news publications on Instant Articles platform. The Instant Articles platform has been on the rise since April 2016, when it was first launched for widespread use of all marketers and publishers. This new subscription tool is Facebook's attempt to promote adoption through making the platform more attractive. As the buzz around Instant Articles rises once again we aim to see how marketers are affected. 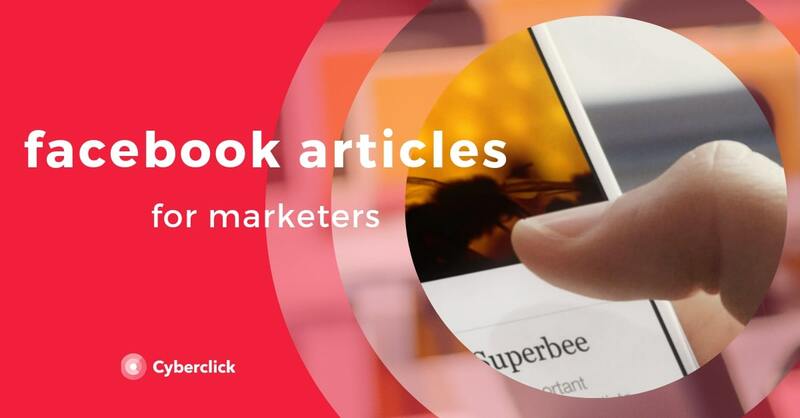 Facebook’s Instant Article platform allows marketers to host content directly on Facebook. This creates a fast and immersive user experience where consumers can seamlessly browse content without additional links that direct users back to new sites. What does this mean for Facebook marketing? A new method of distribution will lead to new patterns in traffic. Traditionally content marketing is hosted on your own site. This means that inbound links mentioning the content from other sites, such as Facebook, directly link back to your own site. The more inbound links you have, the more authority is given to your site in search engine algorithms, and the higher you will rank in search results. With Instant Articles, shares and links are fully contained within Facebook. This implies there are fewer inbound links driving search traffic, and marketers could become more reliant on Facebook as a traffic source. The implications on traffic will vary for each firm. A key factor for consideration is whether you are targetting new vs. returning users. Instant Articles don't make the content provider as obvious as your own web page would. If you're primarly targetting new users, it's highly important to communicate your brand/who you are, perhaps through design efforts. Traffic is important, but it’s not everything. On top of attracting attention from potential customers, marketers aim to engage with their target market and convert them through the buying journey. 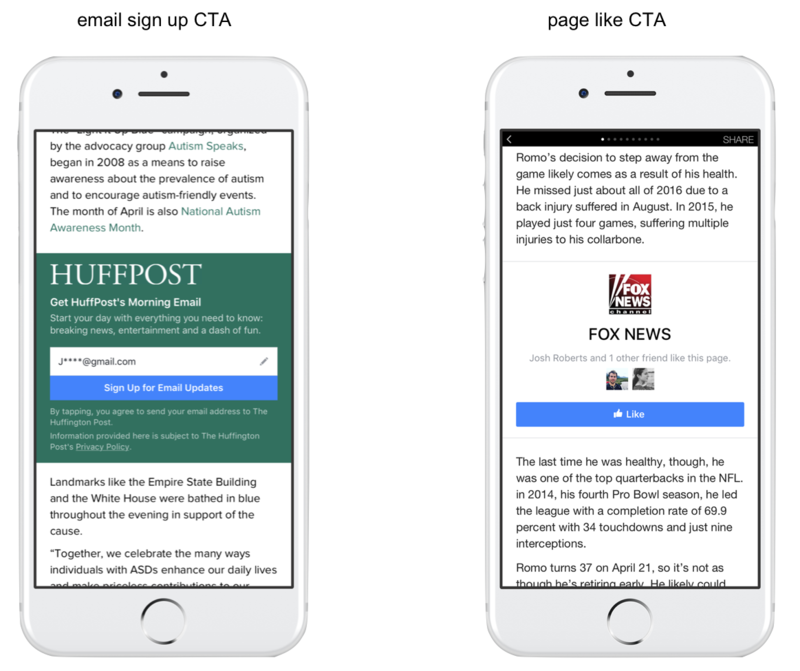 Instant articles now offer a more immersing experience with integrated call-to-action units. These units offer a seamless journey for customer engagement. Two units that are proving highly efficient are the email-sign-up-CTA-unit and the page-like-CTA-unit. Instant Articles are gaining traction. Business Insider commented, “In the past 6 months, Instant Article users have grown over 25% — more than 10,000 publishers now use Instant Articles. Additionally, a third of clicks on Facebook now lead to Instant Articles”. The bottom line is, Facebook understands its users. The experience is reader centric, allowing easy access, easy engagement, and on top of it all easy sharing. Sharing on social media is a great way to promote growth, and the integrated sharing feature is making it even easier for users. At the end of the day, Instant Articles can add great value in terms of engagement to your inbound marketing techinques. The cost that marketers may have to pay is their degree of control over content as Facebook takes over in distribution and analytics. One of the things that makes digital marketing so fascinating is that it never stops changing. New tools and technologies will continue to rise. The best way to stay competitive is through an open mindset. Continuous testing and results analysis is the key to data driven decisions. Maybe your next big challenge will turn out to be your biggest opportunity to success.